Burnley moved up to third with a fourth successive league win over MK Dons at Turf Moor. Sam Vokes opened the scoring for the Clarets with an unstoppable shot, high past the diving David Martin. MK Dons equalised, with Carl Baker's header late in the first half bringing the scores level. 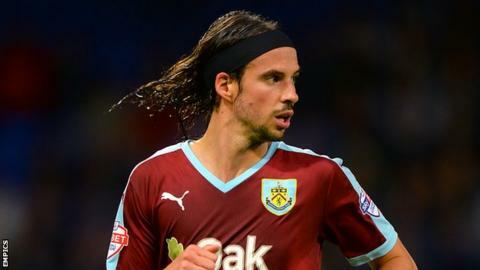 But Sean Dyche's men were back in front just after the break when George Boyd met the ball with a stunning volley, beating Martin low at his near post. Andre Gray's shot from 12 yards was stopped well by Martin before Vokes found the net with a fine shot. Samir Carruthers' teasing cross from the right found Baker at the back post, and the midfielder did extremely well to get above his man to head past Tom Heaton. Burnley regained their lead, though, as Gray's pace created time and space and his cross was perfectly weighted to the back post, where Boyd found the net. Martin was the busier keeper in the second half as Burnley tried in vain to score a third. Burnley manager Sean Dyche: "That was probably as fluid as we've been this season to open up opportunities. "And the last 20 minutes shows the character, the will and the desire of the teamwork and the framework, all those things that are essential for the Championship season. "I've spoken about our fluid play and there was a lot on show tonight, but there's still more to come." MK Dons boss Karl Robinson: "I'd obviously say we deserved a point. "When you see the stats back I thought the game was very even. For a team that has just been promoted to come here and play like we did was brave. "I thought we moved the ball very well and we looked a good side. We looked a little naive in certain elements of our play, but that will come the more and more we play at this level." Match ends, Burnley 2, MK Dons 1. Second Half ends, Burnley 2, MK Dons 1. Diego Poyet (MK Dons) wins a free kick in the attacking half. Foul by Chris Long (Burnley). Delay in match David Jones (Burnley) because of an injury. Antony Kay (MK Dons) is shown the yellow card for a bad foul. Foul by Antony Kay (MK Dons). Rouwen Hennings (Burnley) wins a free kick in the attacking half. Offside, Burnley. Scott Arfield tries a through ball, but Rouwen Hennings is caught offside. Corner, Burnley. Conceded by Diego Poyet. Attempt blocked. Matthew Taylor (Burnley) right footed shot from outside the box is blocked. Assisted by Chris Long with a cross. Josh Murphy (MK Dons) wins a free kick in the defensive half. Hand ball by George Boyd (Burnley). Foul by Matthew Taylor (Burnley). Offside, MK Dons. Dean Lewington tries a through ball, but Sam Gallagher is caught offside. Substitution, MK Dons. Daniel Powell replaces Dean Bowditch. Foul by Dean Bowditch (MK Dons). Attempt blocked. Rouwen Hennings (Burnley) left footed shot from outside the box is blocked. Assisted by Andre Gray. Attempt blocked. Josh Murphy (MK Dons) right footed shot from the left side of the box is blocked. Assisted by Samir Carruthers. Substitution, Burnley. Rouwen Hennings replaces Sam Vokes. Substitution, MK Dons. Sam Gallagher replaces Simon Church. Attempt saved. Michael Keane (Burnley) header from the centre of the box is saved in the bottom left corner. Assisted by David Jones with a cross. Corner, Burnley. Conceded by David Martin. Attempt saved. Sam Vokes (Burnley) header from the centre of the box is saved in the centre of the goal. Assisted by David Jones with a cross. Corner, Burnley. Conceded by Dean Lewington. Substitution, MK Dons. Josh Murphy replaces Robert Hall. Attempt missed. Andre Gray (Burnley) header from the centre of the box is too high. Assisted by George Boyd with a cross. Attempt missed. Scott Arfield (Burnley) left footed shot from the centre of the box misses to the right. Assisted by George Boyd.